Easy to get along, friendly, have lots of friends: various traits labeling you who have an extroverted personality. However, it is not uncommon for extrovert people to be considered a problem, lack of discipline, "superficial", not even clever. So, what is the actual extrovert characteristic? Hanging out. People who have extroverted personality are most like to gather. The extrovert is you who never feel lazy or reluctant to answer "OK" when there is an SMS: "See you in a place we've always been." Party. Family get-togethers, thanksgiving parties in the office, and friend's birthdays never missed you. You also will not refuse when there are friends who take you to go to karaoke or clubbing, to just have fun and enjoy the atmosphere of the night. Traveling. Where are you going? Enjoy the atmosphere of the mountains in Mount Everest, snorkeling at near lake, or shopping in Singapore? It's OK as usual. Talk too much. Extroverts are unique. In addition to the hobbies that allow you to actively move and meet many people, you are most comfortable talking. 2. In addition, you have habits that sometimes make others (read: introvert) feel ... amused! Selfie. You are an extrovert is likely to hook to appear. Not just being comfortable with your looks and yourself, but you have a pretty high self-esteem. Using mirror. Often meet many people also make you care enough about appearance. You also do not hesitate when the center of attention. It is for that reason that you so endure lingering in front of the glass to check your appearance. Upload videos on YouTube or Instagram. This one is indeed unique. Although not all extroverts do this, extrovert personalities do tend to like to "perform". According to you, occasionally upload funny videos when hanging out with family or friends can be exciting entertainment. 3. However, the word "exist" is the one that most often appears in the dictionary of your life. You think, rather than stay in your room, it's better to go out and meet your friends. In addition to showing your existence, it is also important to know the information and new things that happen around you. 4. Missing Sunday night without a gathering with friends makes your life like ... null! Staying at home without a chat buddy makes you bored! You can even stress if no one else is willing to accompany you. To be sure, you are a friendly person, cheap smile, and good at getting along. So, do not be surprised if your friends a lot. 5. Often, you get into the ranks of popular kids at school, college, or your office! Popular predicates often make you a leader. Sometimes, your fun characters make it easy to start a relationship. 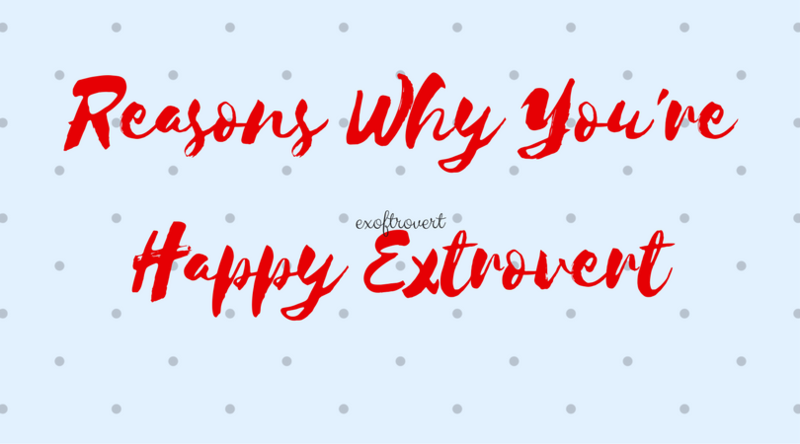 But the life of an extrovert is not about fun. Often the opposite is true. Although many like your joy, not infrequently anyone will see you with disgust. They just hope you can ... silent! 6. You are also considered not to be disciplined. An extrovert tends to do things casually. You think there's nothing wrong with doing chores while singing, gesticulating, or chatting with friends. For you, these kinds of ways just keep you excited. Unfortunately, not everyone understands your character. Many even think you are undisciplined and act casually. 7. You just a little difficult to focus or concentrate. For example, while working on a task, you are often tempted to invite your coworkers to talk or joke. For you, staying too long in front of the computer screen makes you bored and saturated. You tend to like things that are fun and only. But, people just think you are shallow and less intelligent. When smart people can be calm and calm, you are a lot of talk and laugh is not considered smart. Because the proverb "empty barrel sounds" still has not changed the meaning until now. 8. Supposing, you are an oasis in the middle of the desert. You can always refresh the atmosphere. Your ever-vibrant and cheerful character can rub off on the people around you. Your presence that makes family and friends feel cheerful and enthusiastic. Every attitude you show is far from intentional or fake. It all comes naturally and you are sincerely nice to everyone you meet. 9. Extrovert is you who celebrate life with happiness. Do the things you really want without the shyness. For you, life must always be happy, smiling and laughing a lot. There is no need to be ashamed to point out what you are, even if your attitude may seem silly or even stupid. To be sure, you know how to have fun with you and the people around you. 10. Your character becomes the main capital to be successful in many fields. Friendly and sociable characters allow an extrovert to have many friends. In work and career, the breadth of connections becomes indispensable. For you, finding a job is not difficult. Just prepare some folder cover letter and leave it to your friends. An enthusiastic, responsive, and quick-paced attitude can make you an accomplished employee for your colleagues. In addition to your friendly attitude, you also gentle hand to those who need your help. Even when it has been hit by a lot of work, you can still look cheerful when meeting your boss. 11. The extrovert character makes you a person who always thinks positively and optimistically. Life never promises happiness. Every day, you are required to be ready to accept a challenge that has two possibilities, failed or succeeded. However, none of them shrink your guts. As long as you can live your days with cheerful, a lot of you will be able to grip!